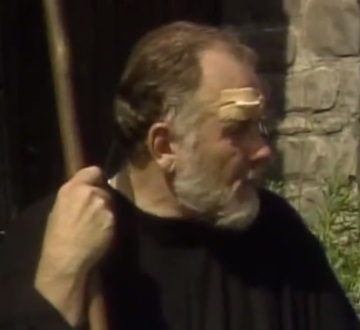 Today’s beekeeper appears in the Littlest Hobo episode called “Dragonslayer”. He doesn’t have a major role, the story is actually about some children that the protagonist doggie helps through some dangerous woods, but he the episode’s climax still focuses on the beekeeper. The beekeeper is not given any name, but he has a cool black beekeeping outfit and carries a big stick. His land, which the kids wander through, seems to be rigged full of traps that he probably set (there are many dangerous animals in his woods too). Those are all pluses for a beekeeper’s score. Also, when he comes across a bear breaking into his hives, his instinct is to attack it. 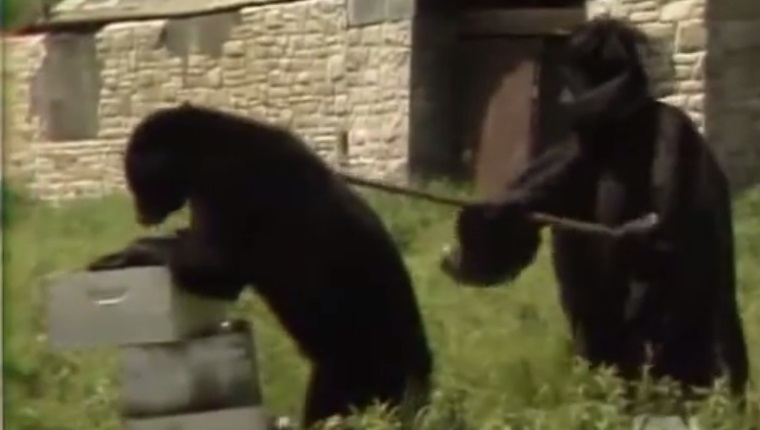 Granted, the bear beats him up and he has to be rescued by the star of the show, but still. He charged a bear. That’s pretty cool. If his loss to he bear was the only strike against him, that’d be a pretty good beekeeper score. Sadly, another concern is the scope of his apiary operations. It is probably a result of the show’s Canadian Television budget, but within the narrative, those boxes we see the bear attacking at the extent of this beekeeper’s honey farm. In spite of all the land he seems to own, that’s all he’s got. It is also worth noting: when one of the kids asks why he didn’t just shoot the bear, the beekeeper says “No crime in a bear wanting honey, even if it is the best wild honey in the country.” There’s so much to unpack there. He holds no grudge against the bear, so he’s doing well for the Beekeeper Rage. But he also calls it “wild honey” which isn’t what a beekeeper’s stock would be. I don’t know what to make of that. I wish I could go higher, but with the evidence we have there just isn’t enough to justify a higher score.